This might lead us into buying an extra racquet and vowing to play this racquet until the end of time because no other racquet has ever made us feel this good about ourselves and our tennis games. But just wait a few weeks and you’ll have an off session and you might start finding some faults in the racquet and how it affects your game. Suddenly you’re thinking, “how naive I was!” And you risk going into the mode of “I need to get a new racquet!”. If stores allowed us to demo a racquet for a couple of months it would be a lot cheaper and easier to make a qualified decision on a racquet purchase. But we’re lucky if we get to try a racquet properly before we buy it and then we might either hate it at first hit and give up on it or love it for three weeks and then have a slump and soon enough you’re putting a for sale ad up on tennis forums or flea bay. I’ve been around the block a few times when it comes to tennis racquets and I thought I knew this process inside out, but I was close to fall into another trap with the Babolat Pure Strike I’m using at the moment. You see, I first play-tested the racquet at a time when I was happy with what I was using so even though I was pretty impressed I didn’t want to make the switch. Then when I was in a period of “it would be fun with some more power” I decided to test it again and despite it being strung with a dead poly (in this case Babolat RPM Blast ) I played great and promptly decided to buy two racquets. I’ve been testing out different strings for a couple of weeks and really come to enjoy the feel of the Solinco Hyper-G in the Babolat Pure Strike . It gives spin, control and impressive comfort for a polyester string in a rather firm racquet. I haven’t had any arm problems whatsoever. But at this stage, a couple of weeks in, I can’t be sure that this is going to be “the one”. I just need to keep playing with it. Sometimes I will play well – other times bad and I can’t always blame the racquet for this. Most of the time it’s in my own hands. It’s very easy to blame the racquet or the strings for a tennis player, but no matter how hard it is to accept sometimes, usually it’s you. I’m not saying that you might not have the wrong racquet and that that doesn’t make a difference – because it does (otherwise I wouldn’t be running a site called Tennisnerd about tennis racquets and gear). Make sure you stick with a racquet for a longer period of time (depending on how much you play) because you need to groove with it and get to know it properly. For example 2-3 months. 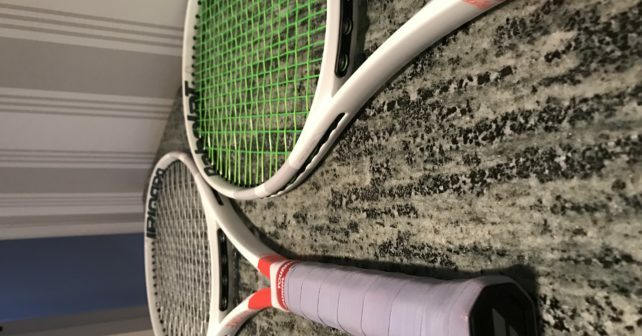 There are things to try before giving up on a racquet such as: racquet customisation, changing strings, changing string tension. Have a close look at your own game before you go back and forth between racquets. Sometimes your game can be affected in some way by a new racquet. Make sure to pay attention or ask your partner if it does. Do you have your own examples of racquet honeymooning? Please share in the comment section!